Allie Norris, SFYSA '13, performs at the 2012 Spring Orchestras Concert. 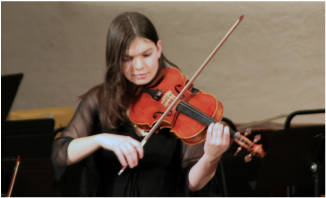 She graduated from McGill University in 2018 with two degrees in viola performance and currently performs and works in Santa Fe. The Allie M. Norris Youth Leader Scholarship provides full tuition for one season to a selected student in the Youth Symphony Orchestra. The equivalent amount of the scholarship may be used for a summer music program, or, if the recipient is a senior, toward college costs. The Scholarship is named for YSO violist Allie Norris, who, while a student, demonstrated professional-level attitude and mentoring skills throughout her career with SFYSA. The winning candidate will share Allie's qualities of high artistic and technical proficiency, a manifest devotion to teaching and mentoring, a tenacious spirit of giving and humility, and an ever present willingness to get the job done. 3. The student must have served as a mentor for an SFYSA ensemble for at least one (1) semester. 1. A brief essay, written by the applicant, discussing his or her experience as a leader, mentor, or teacher. • The essay length must be no longer than 600 words. • Quality, not length, is paramount. 2. Two(2) letters of recommendation, one of which must be from a musical professional. • The letters must be sent directly from their authors, to either the email or postal addresses listed below. Applications may be submitted by email or post. Applications will be accepted until April 15. The winner will be notified on or before May 1. The Allie M. Norris Youth Leader Scholarship will judge an applicant solely on the contents of his or her application package, as numerically outlined above, and not by any other criteria. The Scholarship can be used for YSO tuition in the coming season, a musical summer program, or college tuition, if the student is a senior. The Scholarship reserves the right to not choose a winner, if it is determined that no applicant meets the award criteria. Incomplete applications, applications not submitted by post or email, or applications postmarked/timestamped after May 1 will not be accepted. Please verify all documents before submitting. The Scholarship is not responsible for corrupt, unreadable, or incompatible files. A student must be in good standing with SFYSA at the time the scholarship is awarded.